Take on the role of Charlie and enter a strange and mysterious world filled with nightmarish hordes of zombies, dangers and many surprises. In this easy to play and hard to master platform you will slay zombies, avoid as well as use deadly traps, and unleash your true potential through a variety of skills and abilities. 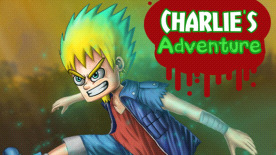 Charlie's Adventure will take you on a journey through 12 unique levels as you face off against legions of zombies. Help Charlie cleanse his world of these vile creatures!